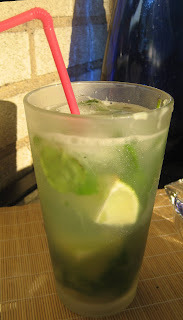 Basic premise: no one orders a mojito for the soda water. However will need to buy soda water or make your own soda water . Step one: Grow mint. This is a very important step. Mint at the grocery store is expensive and you will not put enough in if you are paying $3 a drink for the mint alone. Shown on the right are Curly Mint, Spear Mint, Irish Mint and Banana Mint. Step two: pour two shots of white rum over a big hand full of mint leaves. Smash it up a bit with a fork. Step Three: stir a large tablespoon of white sugar into the rum and mint mix. Step four: Juice two small limes and cut a third into 8ths. Add the juice to the rum and pour the rum and juice over ice. Add 4 of the lime 8ths to the drink. Step five: titrate with club soda to taste. Curly mint and ireland mint. I suggest step-by-step photo instructions. Also i have suggestions for improvement of steps.